I’ve just got back from a research trip to the Sunshine Coast, where my new book (working title “Isabella’s Gift” but watch this space) is set. Unfortunately, I spent a great deal of the trip flat on my back with my leg on a pillow. A couple of weeks ago I sprained my ankle on one of my mountain walks, and if that wasn’t bad enough, last week I had an unexpected and violent reaction to the sports tape the physio used to strap me up. My ankle and foot blew up to twice their size, and were all scabrous and red and vile and blistery. It looked like a Frankenstein foot. No, really. I would put a picture here, only people would never come back to the blog again. 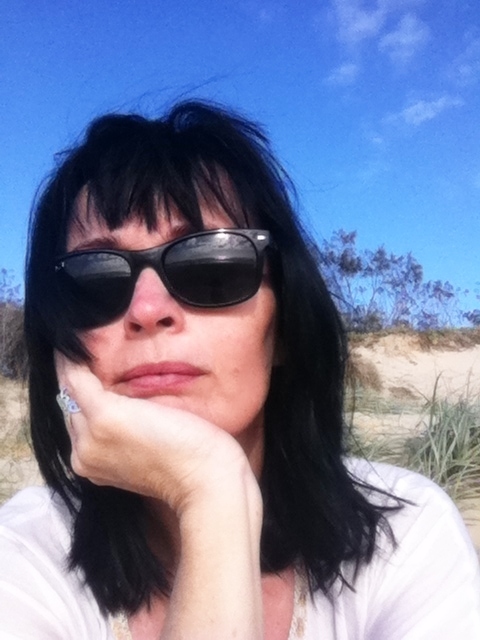 So instead here is a picture of me looking grumpy with my lot, on Marcus Beach at Noosa. It’s very hard to look this grumpy in paradise. I took the photo at 6am. Look at the sky! Can you believe how beautiful dawn looks in Queensland? Anyway, I had better get on with finishing this book, hadn’t I. With my left leg out of action, I really have no excuse. I’m working in bed now, and this will have to be my office until I’m up and about again.